Many years ago magazines such as Road & Track, Sports Car Graphic and Car & Driver used to cover racing in considerable detail. Henry Manney, Rob Walker and Innes Ireland's Grand Prix reports in Road & Track were required reading. They were deeply informative insider's stories, well written and entertaining. But over time, in order to build circulation the likes of Road & Track and Car & Driver progressively reduced their racing coverage and expanded their coverage of cars and the auto industry. Today, racing barely exists in America's car buff magazines occupying mere sidebars with no reportorial or literary value. But the decline in racing coverage in these and other magazines is just the tip of the iceberg. A look back at America's print media landscape over the past fifty years records an equally sweeping decline exacerbated over the last decade or more by the rise of the internet and its assault on the traditional print media business. Back in the sixties and seventies race fans across America could buy and read weekly accounts of all kinds of motor racing in National Speed Sport News or Competition Press & Autoweek. Under Chris Economaki's hands-on leadership and direction Speed Sport News thrived for decades while Competition Press was transformed in the mid-eighties into Autoweek, a weekly magazine featuring increased coverage of cars at the expense of racing. For my part, I started my career in Toronto in the late sixties with a Canadian version of SSN called Wheelspin News. Published by drag racing promoter 'Dizzy' Dean Murray, Wheelspin covered drag racing, oval racing and road racing. I did some freelance work for Wheelspin and soon found myself as the road racing editor. I wrote many stories and columns about Ontario and Quebec road racing and worked a couple of days and nights each week with Murray and his small team to put out the paper every Wednesday. I also freelanced for Autosport in the UK, writing short stories about the Gulf Canada Formula A championship and some Canadian Formula B races too. In 1973 I convinced Autosport to hire me as their US correspondent replacing Pete Lyons who had moved up to cover Formula 1. Over the seventies I covered Can-Am, Formula 5000, USAC's three 500-mile races plus the Daytona 500 and 24 Hours and Sebring. I also freelanced during that time for Competition Press and anyone else who would employee me including Formula and RaceCar magazines. In 1980 I was part of a small group of people who created and launched On-Track, originally published in California by Paul Oxman. On-Track came out every two weeks and we worked our tails off to fill the pages with good copy. It was well-received and for a while we hoped to turn it into a weekly and go head to head with Speed Sports News by providing more detailed and modern coverage of the sport. But the resources weren't there to tackle that job and I was soon seduced by a charming Southerner named Robb Griggs who published a weekly NASCAR newspaper called Grand National Scene. With CART beginning to boom Griggs wanted to get into Indy cars and in 1983 we started a monthly magazine called IndyCar Racing. Working with Griggs was a pleasure. He was a bright guy and a promoter and we enjoyed a few good years together but NASCAR was growing fast and Robb struggled with CART's internal politics. Grand National Scene was doing well and would grow into Winston Cup Scene, America's largest selling racing publication with 130,000 copies sold each week at its height in the late nineties. Griggs eventually sold Winston Cup Scene for many millions of dollars. Meanwhile, in 1985 I was pitched by George Levy to join him at AutoWeek as an editor at large, focusing on Indy cars but also writing about all aspects of the sport. This was during AutoWeek's transition from newspaper to magazine format. George was also a bright guy and a serious racing enthusiast and we enjoyed three or four great years together. Financially, working for AutoWeek was better than anything else I've done in racing journalism. I was paid a retainer and some expenses and the magazine built circulation and credibility. But then George left to start his own business as a consultant to the auto industry and advertising writer. Without George the dynamic changed and some CART politics I won't bore you with further complicated the situation. Through these various US projects I continued as Autosport's American correspondent and enjoyed steady freelance work in magazines around the world. 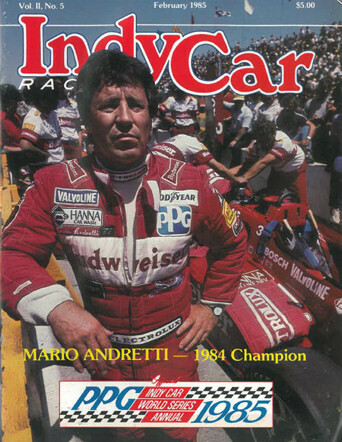 An added bonus arrived in 1991 when Marlboro hired me to write Indy car race reports and news stories on a pre-internet bulletin board called the Marlboro Racing News. I did that work through the nineties until anti-tobacco legislation began to force the cigarette companies out of racing. Three times during that period I was fired by CART for writing things they preferred not to read but each time I was re-hired by Marlboro who insisted they were paying for a news site not a pr service. In the Marlboro news service I was witnessing a harbinger of the future where the internet is king. But I continued my romance with newspapers and magazines. In those days American newsstands carried monthly titles like Stock Car Racing, Circle Track and Open-Wheel as well as Speed Sport News and AutoWeek and I wanted at least one more shot at helping create and establish a proper, broad-based US racing magazine. It finally happened in 1992. 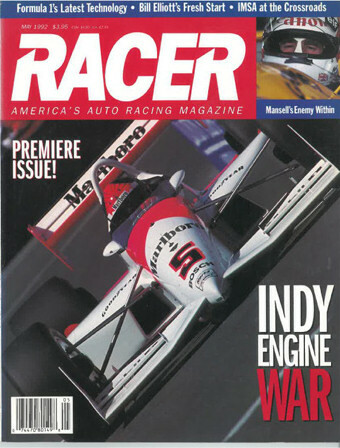 After a year or more of pulling it all together Paul Pfanner was able to launch Racer magazine at Long Beach in '92. 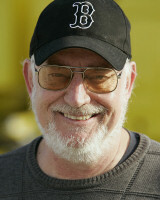 I had worked with John Zimmermann at On-Track and AutoWeek and John took over the editor's seat with me serving as editor at large. Again my focus was Indy cars but I wrote about everything else--NASCAR, F1, sports cars and young stars on their way up. I spent five years with Racer and I'm proud to have been part of the magazine's creation. Through the first decade of the new century I wrote a monthly column and occasional features in Road & Track. But R&T's interest in Indy car racing began to wane. Then the magazine was bought by a new group resulting in all of R&T's long-standing old boys losing their jobs to a new regime. Freelancers like me also fell by the wayside. Like every other magazine Racer and R&T have struggled with the boom of the internet and the decline of newsstands and the print media. Digital is king and it's tough to deliver a newspaper or magazine that provides more than the reader has already encountered on-line. Around the world most established print brands are facing steadily falling circulation as their websites gather strength. The problem is that advertising income from the web doesn't match the lost revenue from print. It's a riddle that remains hard to solve. Today, Autosport in the UK sells a mere 5,000 copies each week, down from between 85,000-100,000 in the magazine's 1990s heydays when Brit heroes Nigel Mansell and Damon Hill helped sell a bundle of magazines. 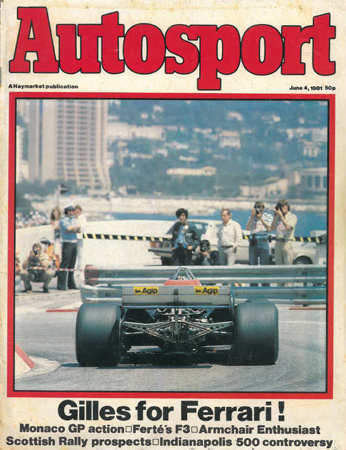 The highly respected and beautifully produced Motor Sport magazine in the UK for whom I work as US editor sells 40,000 each month, down from a high of more than 150,000 back in the eighties. Road & Track sells around 400,000, down by almost two-thirds from its historic high of about 1.2 million. Other interesting data comes from my old friend David Morgan-Kirby (we're not related) who for many years owned 'Mags and Fags' an international newsstand in Ottawa. David sold the business four years ago and at the time 'Mags and Fags' carried 6,000 magazines and 200 newspapers from around the world. Today it carries about 2,500 magazines and just twenty papers. "When we sold I knew the business was in serious decline," Morgan-Kirby recently remarked. "But I had no idea it would accelerate as rapidly as it has. It's a sad story, but it's the way of today's world. The newspaper and magazine business is in serious trouble." Thus does motor racing have to rely on the internet to get the news out, inspire the fans and create a reliable measuring stick for advertisers and sponsors. It's unavoidable that American racing's tumble toward irrelevancy in the marketplace has coincided with the fall of the print media and there's no question that the sport has to find a better way to connect with its fans and broaden its appeal. For me, it's been a long and interesting journey. Thanks to Joe Freeman at Racemaker Press in Boston I've moved on to become primarily an author and historian. Joe is the best editor and publisher I've ever worked with and it's a pleasure to produce the high quality books that he and Racemaker are committed to. These days my focus is on the past. I leave the future and hopes for any solutions to the challenges I've discussed to younger generations.